The Laboratory for Space Research (LSR) of The University of Hong Kong, announces its plan to immediately establish a new LSR at HKU Zhejiang Institute of Research Innovation (HKU-ZIRI) in the Lin'an district of Hangzhou in Zhejiang province. With a strategic investment of HKD 10 million, the laboratory is designed to help put Space and Planetary Sciences and related activities squarely on the map at HKU. These are very exciting times for Space Science both globally and particularly in China with its significant investment in major missions to the Moon, Mars and with the upcoming Space Station. These all provide important opportunities for Hong Kong based science. 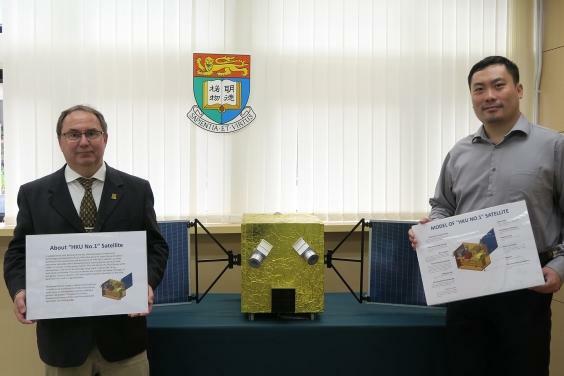 This new LSR initiative will allow HKU to participate in important space science projects such as the proposed HKU No.1 satellite planned for launch in 2019 that will use novel "Lobster-Eye" X-ray technology to look for evidence of mysterious dark matter, undertake a study of hot gas in rich galaxy clusters, look at comets in the solar system and explore the interaction of the solar-wind with the earth's magnetosphere. This broad mission scope is highly interdisciplinary. It effectively combines the fields of astronomy, earth science, and planetary sciences, making a perfect LSR project. The potential science dividend and impact of this satellite are globally significant and cutting-edge. The LSR has just leveraged two jointly funded postdoctoral fellows between HKU-LSR and two elite Mainland universities: the KAVLI institute for Astronomy and Astrophysics at Peking University and the Space and Astrophysics group at Nanjing University. Professor Quentin Parker, Acting Director of LSR, on commenting on the new jointly funded postdoctoral fellows with the aforementioned universities said "This exciting development will help turbo charge our collaborations and opportunities for HK based scientists with top Mainland Space and Astrophysics groups." Professor Parker has also been appointed as an adjunct Professor at Zhejiang University who host the Mainland's pre-eminent microsatellite research group. They have agreed to offer practical support in setting up our LSR at HKU-ZIRI. A strong collaboration with them is promised, so linking HKU and the LSR directly to the 3 top Mainland universities in Astrophysics, Space Science and Satellite technologies. With the new initiative of a laboratory on space research at HKU-ZIRI and participation in the HKU No.1 satellite opportunity Parker also stated "we are well placed to emerge over the coming years as a true force in Space and Planetary Science in Hong Kong, the Mainland and globally." The Laboratory for Space Research (LSR) plays an important role in strategically and favourably positioning HKU astrophysics and planetary research to a higher level. Well situated in a dynamic region of Asia to foster links with the space science community in China and globally as is already occurring, LSR's interdisciplinary research launches various bids to exploit and access the emerging Mainland funding and research environment. We plan to develop multilateral and strategic partnerships with world-leading space science institutes, and participate in large, international, high-impact space missions. We see this as an effective means to better position the LSR, the Departments of Physics and Earth Sciences, the newly established Research Division of the Faculty of Science and so HKU, as a serious node of knowledge, expertise and capacity in space science and related disciplines. An exciting new "Space" partnership was established in Jan.31st, 2018 in Shenzhen. This collaboration, including the School of Astronomy and Space Science of Nanjing University, the Beijing Institute of Space Mechanics and Electricity, Satelliteherd Ltd. and Beijing Origin Space Ltd., HKU LSR is working on the construction, assembly, and testing of the "HKU No.1 satellite". This is an X-ray astronomy telescope with a focused primary science goal to search for dark matter in massive nearby galaxy clusters. This will also be the first soft X-ray satellite in the world that uses "Lobster-Eye" technology. The science mission also includes the study of hot gas in rich galaxy clusters, comets in the solar system and the interaction of the solar-wind with the earth's magnetosphere. The satellite launch is anticipated in mid 2019.